Tinie, today a multi award-winning singer, with two best-selling albums and two UK number one singles under his belt, was back in 2003 an unknown 14-year-old Londoner just beginning to try to make it as a performer. Dumi, the son of a family friend, and then 20, was at the time starting out in music management. He says that after first hearing Tinie rap he immediately tried to persuade the singer to sign with him. 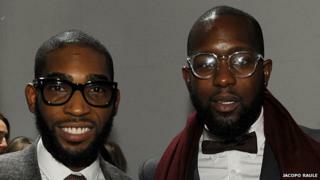 Tinie, whose real name is Patrick Okogwu, agreed, and the two started out together on the road to stardom. Yet with the rapper not getting a record deal until the end of 2009, it was a long six-year journey, often with little cash along the way. Dumi, now 32, says: "Tinie has always been a great performer, but as his manager I needed to boost his profile, such as him being seen in all the best clubs, and meeting all the right people. "So we'd go together to nightclubs, and only have £20 between us. We'd stand there together, not being able to afford to buy a drink, and hoping that no-one would ask us to buy them one, because we just couldn't afford it." Dumi, who like Tinie hails from south east London, was at the time also continuing a degree in sports science at the University of Greenwich. A keen lover of urban music himself, he had tried to forge his own career as a rapper, but says he ultimately realised that his voice wasn't good enough. Instead, he decided that he would be better suited as a music manager. So while finishing his degree, to make sure he had a different career to fall back on if he needed to, he says he started to study all he could about music management, via the internet and by buying books. But in addition to helping Tinie record new songs, offering musical advice, and driving him to live performances, Dumi says he worked hard on making Tinie more confident, more streetwise. "It was obvious that Tinie had massive talent, he looked good... he was great at rapping, but he was young and needed to live a little, so I took him under my wing for a few years," says Dumi. "He had all the ingredients to be a star, I just needed to polish him. I always knew he had commercial potential, I just had to make him street credible." So working together, Dumi helped Tinie get his songs played by influential DJs, and create a strong image to stand behind the singer's songwriting and rapping skills. Dumi adds: "It is the same in music as in any other industry. You have to do the public relations, you have to build a buzz. But you can only do this successfully if the person or product is honest." While Tinie and Dumi refer to themselves as cousins, they aren't actually related. Rather, their families are originally from the same village in Nigeria, where it is simply custom for the children of friends to be called cousins. Dumi describes Disturbing London as an "entertainment and lifestyle company", and in addition to management it has a record label and fashion brand of the same name. Run as a lean ship, it currently only has seven employees. The east London-based business now manages seven acts in total, including singer Jessie J. Explaining his management approach, and how he earns the industry standard 20% cut of his artists' earnings, Dumi says he writes out a five-year plan for each of his acts. "I work out what we need to be doing in each of the five years," he says. "And at the start of each [calendar] year I will email each artist a list of bullet points, of what we need to do, such as singles, albums, tours, videos, relationships, perceptions," he says. "And I do this from the position of being a fan of each act, I think, what would I want as a fan?" Although Dumi has had no formal business training, he says he is good at learning as he goes along, and thanks his accountant and businessman father, and social worker mother, for giving him the confidence and drive to succeed. "I do everything with a smile, I do friendly business... I'm doing what I love," he says. "[But] if people think they can take advantage of my kindness and smile, then more fool them. "You can't run a business like mine if you are an idiot. And I can be assertive if needed."